Continuous monitoring and central control of a multiple compressor installation can generate substantial savings. These frequently provide a very short payback period on the installation cost of a monitoring system. 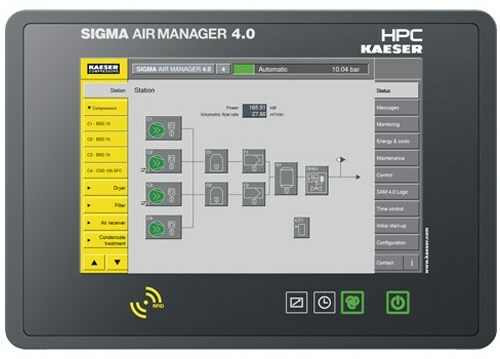 A SAM 4.0 offers DIN EN ISO 50001 compliant energy management. The SAM 4.0 compressor controller is a cutting-edge master controller. It has the ability to monitor up to 16 compressors simultaneously. Using the latest web technology, it ensures that your compressors are working at optimal efficiency. It also ensures maximum availability and minimised maintenance for your compressors. It allows for remote plant monitoring with alarm and warning messaging. It also provides real-time energy cost measurement. The Sigma Master Controller 4.0 has the ability to control up to 16 compressors. It offers continuous, real-time analysis, monitoring and optimisation of your compressors to maximise efficiency and reliability. SAM controllers are featured on the UK Government’s Energy Technology List (‘ETL’). This means that the government has independently verified these are very energy efficient products which are in the top 25% of products in their class. This means that they qualify for Enhanced Capital Allowances (‘ECAs’). ECAs allow the full cost of the purchase (and a fair allowance for its installation) to be written off against tax in the year in which the equipment is purchased. In most cases this represents 5.5x the tax benefit of normal capital allowances. Please note: We are not professional tax advisers. .
We recommend that you contact your accountants for further advice prior to purchasing a SAM controller. We are also very happy to organise professional tax advice for customers.